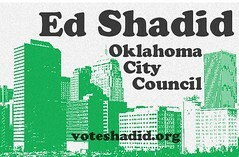 Send a message that Oklahoma City should have transparent elections by voting for Dr. Ed Shadid in today’s Ward 2 council election. Shadid, a local physician, faces Charlie Swinton, a banking lobbyist, in what is supposed to be a nonpartisan and a fairly simple runoff election for city council, but the race has become both highly partisan and controversial. Both candidates have the experience, credentials and community stature to serve the city, but the election has been tarnished by a group, the Committee for Oklahoma City Momentum, which has mailed distorted, bogus advertisements to Ward 2 residents that attack Shadid for being a caricature of a liberal. (I wrote about the ads more extensively here.) Those people who have funded the group remain anonymous. Swinton has said he “detests” the current political milieu, according to a media report, but he didn’t apparently do anything to stop the ads. Why not? A lot of liberal people live in Ward 2. Momentum and its supporters mock the democratic process here; what do the people funding the group want? It has spent more than $400,000 trying to influence council races. It’s part of a legal but increasingly corrupt political system here and elsewhere. What really separates Shadid and Swinton when it comes to city issues, with the major exception of Momentum’s support? Unless Ward 2 residents send a message that they want to know who is funding conservative-based attack ads against candidates, then the future is clear. Elections here will be manipulated in secret by the rich and powerful. Will even school board races here be politicized like this in the future? Absolutely. Shadid has run for office in the past as an independent and Swinton is a Democrat. But state Sen. Andrew Rice, the Senate minority leader and one of the leading Democrats in the state, endorsed Shadid after he got fed up with the attack ads. Much of the rhetoric in the ads demeans liberals/progressives with the typical, clichéd conservative mantra. Consequently, in this particular race, liberal Democrats will be much better off by supporting Shadid. Does anyone doubt that rich, secret donors here-at least some of the money has come from a group created by the Greater Oklahoma City Chamber-will fund attacks against Democrats based on the same ideas contained in the Momentum mailers? The material will be recycled and perhaps even used against those Democrats now supporting Swinton or even prominent leaders like Rice. Does anyone doubt that? Shadid’s ideas for the city include making it a healthier place to live and enhancing neighborhoods in Ward 2. He talks about the need for building sidewalks and installing more streetlights. He’s straightforward, earnest and has no hidden agenda. Can we know that for sure about Swinton given the circumstances of this election? Why didn’t he simply threaten to withdraw from the race once the bogus attacks ads began? (He knows the money trail.) Could that have stopped them? If it didn’t, then he could have actually withdrawn from the race. Imagine what that bold statement would have done to assure the integrity of local elections. If Swinton wins, we can expect the 2012 elections here will be an utter free-for-all when it comes to secret money funding conservative attack ads against what should be basic Democratic Party principles. Send a message, Ward 2 voters. « Social Security: Are You Ready For A Congressional "Video Staycation"?